For the original DOS game, see Wizardry: Crusaders of the Dark Savant. Remake of Wizardry: Crusaders of the Dark Savant with updated visuals and narrator voice acting. Characters can be imported from Wizardry: Bane of the Cosmic Forge (see Import characters). 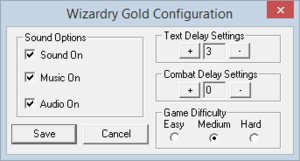 At least the original retail version of Wizardry Gold is infamous for introducing several, even game-breaking bugs which did not exist on the original DOS version. Most famously, the Diplomacy skill doesn't work at all. Includes Wizardry: Bane of the Cosmic Forge and Wizardry: Crusaders of the Dark Savant. Includes Wizardry: Crusaders of the Dark Savant. Characters can be imported from Wizardry: Bane of the Cosmic Forge saves. The game offers several possible beginnings for imported parties. If player imports his/her party before completing Bane, the default beginning is given (the same as with new parties). The rest of the beginnings are reserved for each of the possible endings in Bane. Bane of the Cosmic Forge uses different file extensions for regular saves and completed games (*.DBS or *.BCF). Choose Import (BANE) at the main menu. Change the file type from Wizardry Savegame to All Files (otherwise the saves will not be listed). Choose the save file and wait for importing to complete. Save files (*.SGM) can be saved anywhere. All voiced dialogue is subtitled. The game always runs at windowboxed 640x400 so will be very small on high-resolution monitors. Setting the game to run in 640x480 compatibility mode will make it fit the screen better but makes task-switching very difficult. Right-click WIZARD.EXE and choose Properties. On the Compatibility tab enable the 640x480 option and click OK. These requirements are for the GOG.com version. ↑ 2.0 2.1 File/folder structure within this directory reflects the path(s) listed for Windows and/or Steam game data (use Wine regedit to access Windows registry paths). Games with Steam Cloud support may store data in ~/.steam/steam/userdata/<user-id>/245430/ in addition to or instead of this directory. The app ID (245430) may differ in some cases. Treat backslashes as forward slashes. See the glossary page for details. This page was last edited on 8 April 2019, at 11:08.